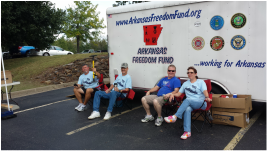 We want you you to know all of the things the AFF is working on and what we do for the Veterans of Arkansas. So we started producing our news letters. If you are an AFF Members and you have something you would like to share with the other members and sponsors, just send it in to Mark and we will get it posted. He works hard to make sure we cover everything, but if we miss something please let him know. We are so proud of all your accomplishments and we want folks to know. Everyone can share your joys and your message to the group. This our current newsletter. We hope you enjoy reading. These are our past newsletter archives. Just click the link to open the PDF.